Temperature, humidity, dew point, wind chill indication. Measuring wind speed in Current/Max/Min/Average. 10 minutes auto off or manual power off. Temperature, dew point, wind chill, ℃/℉ switchable. Barometer indicator, up to 16 groups data can be checked. 1.7" LCD screen displays data clearly. Wind speed unit selection: m/s, Km/h, ft/min, knots, MPH. 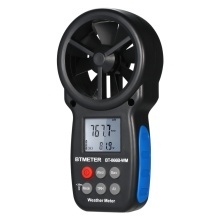 Functions including: Backlight, Manual/Auto off, Wind speed unit select, Max/Average/Current, Wind chill indication, ℃/℉ select, Barometer indicator, Real time measure.